Today, guest writers George Gavrilita and Aruna Prem Bianzino continue developing the method they exposed in Self-Reviews: Asking the Right Questions. This article is a follow up to Self-Reviews: Asking the Right Questions. The idea of the method presented in that article is to let the L3 Quality Definitions guide you, and answer questions inspired by every single sentence of the definitions. Putting your answers together, you would get a Self-Review. While this is a great method to tick this item off the checklist, there are also additional benefits. The reason why the Self-Review item is on the checklist in the first place is for you to identify by yourself your areas for improvement, and see where you have room to grow. Once we transformed the definitions in questions, we can start every answer looking for an example, and this leads to powerful consequences. If we have a positive example, we write a short sentence about it – done. If we cannot come up with an example, we should avoid filler text. There’s no need to fill space, just to be meaningful. Do not describe qualities: evaluators know them pretty well, and you will as well at the end of this process. In this process, having no example or having a negative example for a question is still a great spot to be in. That’s because we’ve just identified a small, defined area of a L3 Quality where we can take action. Can you fill a variety of judge roles? Let’s say you realize you’re really comfortable Head Judging tournaments even with 4-5 people in staff, but you hate Team Leading on Day 2. I hate Team Leading because the first time I did it, I received negative feedback from the Head Judge, whereas everybody is happy with me when I am the Head Judge. There’s a lot going on in that sentence! Why did the Head Judge dislike your work? Was it bad because of lack of experience? Was it because you didn’t communicate enough? Or rather, you just didn’t like being criticized? The feedback I received from the Head Judge was wrong. I didn’t like how they delivered it. It happened in Round 12 and it made me tilt. Bingo! Seems that we went from a Logistics issue to uncover the true one in Stress & Conflict Management. 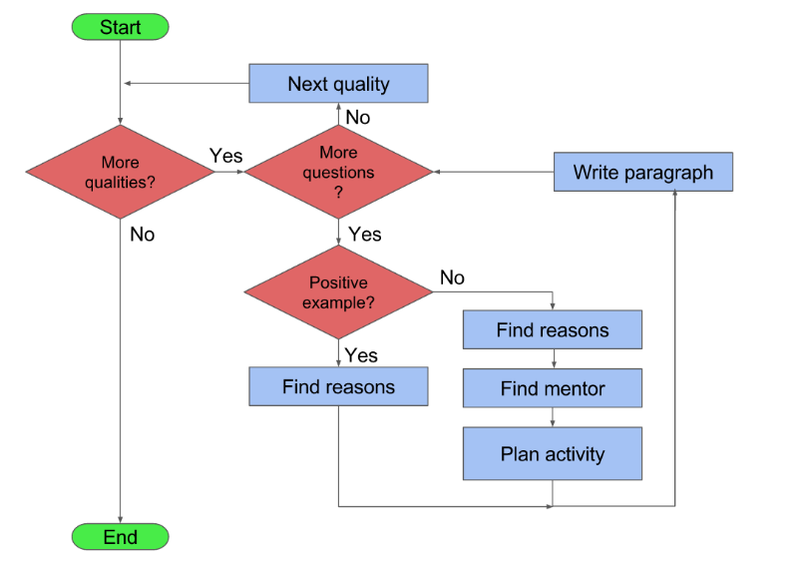 Up to now, we covered the point in the flow chart called “Find Reasons”. Now, we move onto “Find Mentor”. Can you think of someone who is very good at Stress Management in your opinion? They don’t have to be somebody of higher level. Christine is always so calm, even if she makes rules blunders and I have to mentor her. Good, now think about what makes her so good at it. Could you do the same? That is a great activity that you can write down, but -above all – do! I have no clue how she manages. If you cannot understand what makes her so good, talk to your role model and ask for help. If you cannot find a role model, talk to you mentor or L3 of trust, they will surely know who can help you out. I’ve talked with Christine. She noticed that I seem pretty tired when I go to events. She suggested it might be related with my stress levels. She said I can rest more before the events, and eat some energy bars throughout the day to have more energy to deal with unforeseeable situations. I went to the supermarket and bought a family package of energy bars. I put my Judge Tag and belt inside the energy bars package, so I have to open it every time I go to an event. This way, I remember to take two bars with me as well. People that are well fed are less grumpy, and less likely to get in fights or be upset. Meaningful -> The goal you set needs to be meaningful for what you want to achieve. “Judging 52 FNMs next year” is a goal, but it’s unlikely you’re going to face many stressful situations there. I’ve set a daily alarm at 11PM, to remind me I should go to sleep sooner. People that are well rested are less grumpy, and less likely to get in fights or be upset. Action Oriented -> Be concrete in your objectives, they should possibly be measurable and concrete, like “consistently perform DCs in less than 7 minutes”, not simply “be faster at DCs”. The two examples above, setting an alarm and buying something, are something you can immediately do the moment you read it – you don’t need further instructions or reasoning beyond that. Realistic -> Have credible objectives and do not aim to perform a complete DC in less than 2 min, or never go to sleep after midnight for the next 6 months. You won’t be able to do that, so don’t set up failure, so you can fail, and then feel miserable because you failed. Give yourself a chance to succeed. Timed -> Set a relevant checkpoint in time (and no, 2050 is not a relevant checkpoint). Furthermore, it is important that you connect your strategy with the events you plan to judge in the corresponding time window. This allows you to check if the objective is realistic, and helps you focus on the objective during these events. I’ll go to sleep earlier, and pack the two energy bars, for the next 3 PPTQs I’ll judge. even try your strategy for themselves. The Self-Review is about introspection, but nowhere does it say you should keep for yourself the conclusions of your search, on the contrary. I’ve sent my plan to Christine and told her the dates of the next PPTQs. We agreed that I’ll text her every time I have done my “homework” for the coming PPTQ, as a checkpoint. Here’s another example: let’s say I want to improve my Investigation skills, as sometimes I do not know what to ask players and in general I am not confident about the decision I take in the end. I realize the reason for that is my lack of experience, but I think I can get better by reading some specific article, as the “The Search for Collateral Truths” series, which I will do within the next month. I will also participate to at least one workshop on Investigations within the next 6 months. I’ll be at GP London in two months with Emeritus Judge Sherlock Holmes, and that will be a great opportunity to talk about the subject. I’ll make a post on my local Judge Group, and gather 3 specific situations to discuss with him. Do you still find it hard to find examples about the different skills, both positive and negative? Look at the reviews your received. Nothing there? Ask for a specific review to your next buddy and try to plan an activity together. Or you can always talk with your mentors or reference L3. As you can see, this method is not necessarily fast, but it does force you to understand the whys behind your strengths and weaknesses. All of them, in detail. We usually have issues writing about ourselves because we don’t know ourselves, and we hope this investigation will help you bridge that gap. Already at the second PPTQ, the TO came up to me saying that he noticed I was smiling more. He noticed when I handled a player unhappy with my ruling that I was way calmer than usual, and I took the time to explain the philosophy to the player instead of just giving him the GL and move on. I told this to Christine, and she encouraged me to ask to be a Team Leader at the next big local tournament. I did fine, so it wasn’t an issue with Tournament Operations after all, it was just a bad memory of a Stressful incident, and now I think I’m on top of that too. most importantly, insight you can use whether you decide to pursue L3 or not, insight that’s relevant within and outside of the Judge Program. P.S. If you’re still hungry for more, there’s a couple more sources to dive your teeth into.